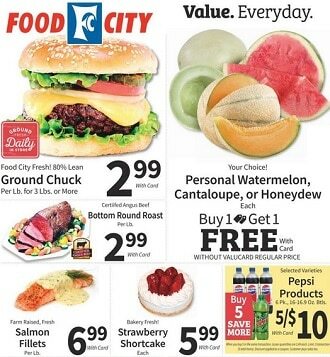 Latest Food City Ad Sale Specials, valid April 17 – April 23, 2019. Don’t miss the Food City Weekly Circular Specials for this week, printable coupons and gluten-free foods deals. Find super savings on almost everything you want like Yellow Sweet Potatoes, Coca Cola Products, Campbell’s Cream Soup, Food Club Cheesecake, Mars Fun Size Candy, Buckley Farms Chicken Nuggets, Full Circle Olive Oil, Asparagus, Cod Fillets, Breakfast Burrito, Mustard Potato Salad, Pineapples, Organic Bananas, Full Circle Organic Milk, Rachel Ray Nutrish Dog Food, Ghirardelli Brownie Mix, Angus Beef New York Strip Steak. Don’t miss this weekly ad deals and don’t forget to print off your coupons before heading out this week to shop.